Prickly pear (Opuntia ficus-indica) is the fruit of a cactus species native to the Americas. In addition to being a generous source of dietary fiber, the fruit boasts a generous vitamin C and magnesium content and is rich in antioxidant compounds, notably betalains and polyphenols. The flowers, pads and fruit of the species all hold great medicinal value and have traditionally been used for treating a wide variety of medical conditions. Prickly pear are believed to help with diabetes, wound infections, inflammatory conditions, respiratory infections, edema, burns and high blood cholesterol. What does prickly pear look like? Prickly pear is a cactus species native to the desert regions of America and Mexico. The species can grow up to 5 meters in height and has sharp spines and colorful fruit. Prickly pear cacti are made up of dozens of flat, fleshy, green paddles which grow at extremely odd angles, usually outwards. The pads function as stems and are either round or oval-shaped. Prickly pear cacti pads are full of sharp, needle-thin, fixed spines as well as tiny, hair-like barbed prickles with a fuzzy appearance. The latter are quick to penetrate skin and difficult to remove as they often leave fragments embedded into the skin. Prickly pear cacti are in blossom from spring till early summer and produce red, yellow, orange, purple and white flowers, after which they start bearing fruit. Prickly pear fruit go by many names, the most common being prickly pear, Indian fig opuntia, tuna fruit, cactus pear, spineless cactus, paddle cactus fruit. Appearance. Prickly pears are about 5-7 cm long, cylinder-shaped fruit with a tough outer skin covered in small, dark bumps full of tiny, fuzzy prickles. Skin color ranges from pale green and yellow to orange-yellow, pink-red, deep red and purple with more colors being present at the same time. 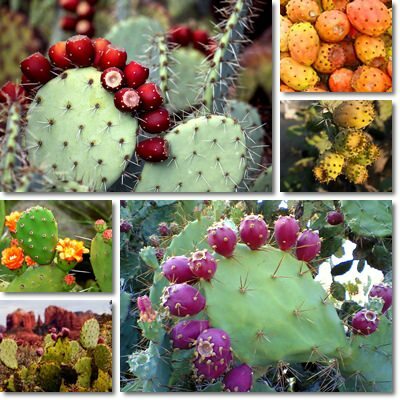 Prickly pear flesh ranges in color from white, yellow and orange to pink red and deep purple. The fruit are filled with small, hard seeds embedded in the flavorful pulp. What does prickly pear taste like? Prickly pear fruit taste somewhat like watermelon and pear, sweet, extremely succulent and incredibly fragrant. Depending on the variety and how ripe it is, the fruit may have a slight acidity to it. There are also some varieties that have a cucumber-like taste, while others are more sour than sweet, especially if not fully ripe. The tiny, plump, hard seeds scattered all over the flesh give the fruit a grainy texture and may make it hard to enjoy. The fruit can be eaten whole (flesh, skin and seeds), unless you prefer otherwise or have problems consuming certain parts (the seeds, for example). What do prickly pear leaves (pads) taste like? Prickly pear flat, pale green pads are also edible and are said to taste like green beans. The pads are picked before the spines have time to harden because they are more tender. 2) Natural anti-inflammatory. In a study entitled An anti-inflammatory principle from cactus, prickly pear stems have been shown to possess efficient anti-inflammatory properties. Beta-sitosterol, a plant compound similar to cholesterol, appears to be responsible for the anti-inflammatory action of the species. At the same time, the fruit’s inflammation-relieving properties are enhanced by its generous vitamin C content. 3) Cholesterol-lowering effect. Prickly pears provide generous amounts of dietary fiber (from 3.6 g to 5.3 g for every 100 g of fruit). Dietary fiber works at the intestinal level, preventing too much fat from being absorbed and reaching the blood stream. This, in turn, reduces LDL cholesterol and triglyceride levels. An animal study on guinea pigs (Pectin isolated from prickly pear (Opuntia sp.) modifies low density lipoprotein metabolism in cholesterol-fed guinea pigs) showed that the soluble fiber in the fruit decreased cholesterol levels up to 33% and hepatic cholesterol levels by 40 to 85%. 4) Antioxidant protection. Prickly pear fruit have been found to contain generous amounts of polyphenols (gallic acid, catechins, vanillic acid) as well as betalains (betanin for red and purple-red fruits, indicaxanthin for yellow and orange fruits). Both polyphenols and betalains (also found in beetroot) provide excellent antioxidant protection against free radical damage, preventing potentially cancerous cell mutations. 5) Wound healing and anti-ulcer activity. According to research, the mucilage monosaccharides from prickly pear pads increase the stomach’s mucosal protection which is believed to reduce the incidence of stomach ulcers (Opuntia ficus indica (L.) Mill. mucilages show cytoprotective effect on gastric mucosa in rat). Topical applications of mashed prickly pear pads are believed to work in a similar manner: polysaccharides from the plant promote skin repair and wound healing (Effect of polysaccharides from Opuntia ficus-indica (L.) cladodes on the healing of dermal wounds in the rat). 6) Constipation relief. Eating prickly pears helps relieve constipation naturally due to the fruit’s high dietary fiber content (3.6 to 5.3 g). Pectin, a form of soluble dietary fiber in prickly pears, not only reduces fat assimilation and slows glucose absorption, hence the fruit’s cholesterol-lowering and antidiabetic properties, but also improves digestion and digestive tract health. 7) Good source of vitamin C and magnesium. Prickly pear fruit provide around 85 mg of dietary magnesium, a mineral that further contributes to cardiovascular health by supporting the activity of the heart muscle as well as 14 mg of vitamin C, a vitamin with potent antioxidant, antiviral and anti-inflammatory activity. It is believed that the fruit’s vitamin C content is responsible for its antiviral properties and explains its generation-long use for the treatment of viral infections. The fruit also contains modest amounts of vitamins B2, B6, B3 and vitamin A, calcium, potassium and phosphorus and only 41 kcal/100 g. It can be consumed raw, chilled for several hours, in salads, ice cream or juices or cooked according to personal preference. You can read more about the functions of vitamins and minerals here. Good to know. However, pregnant women and new mothers are advised to avoid prickly pear due to the lack of information concerning the safety of the fruit during pregnancy and nursing. The fruit may accentuate the effects of diuretic and hypoglycemic medication and trigger allergic reactions in individuals sensitive to one or more components of the plant. Last but not least, prickly pear may cause diarrhea, bloating and even nausea when introduced in low-fiber diets. Marius Lixandru is a highly experienced health author with a background in biology and chemistry. Born in 1984, he has always expressed interest in health and wellness, an inclination which has lead to his studies in human biology and chemistry. He has been fervently writing for this site since 2014 and continues to keep up with the newest technologies and advancements in medicine. He likes to share his personal medical experiences and health-related expertise. In his free time he loves walking, cycling and eating. Ana Lixandru. She has a Bachelor’s degree in modern languages with a double major (English and French), a Master’s degree in Translation Studies and Interpretation and is a licensed teacher. In addition to editorial contributions in the form of personal experiences about physical and mental health and wellness, she is also responsible for copy editing. She is passionate about clean eating and living, follows research papers and medical journals in order to stay on top of the latest advancements in medicine and related disciplines and welcomes the steep learning curve of digitalization. She considers herself an active person and loves to read and cook. mhikl on Sun Exposure: What Is the Best Time for It? This blog is for informational purposes only. It is not intended to diagnose or treat any condition or illness or act as a substitute for professional medical advice.